Home Innovation These new materials work well up to 100 GHz, opening the door for the next generation of devices for advanced communications. These new materials work well up to 100 GHz, opening the door for the next generation of devices for advanced communications. Researchers from the National Institute of Standards and Technology (NIST) have joined with an international team to engineer and measure a potentially important new class of nanostructured materials for microwave and advanced communication devices. 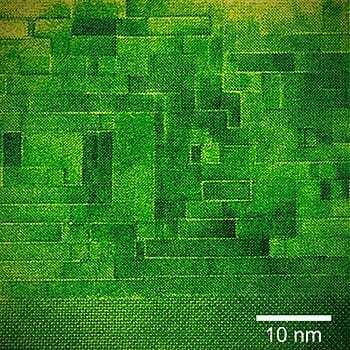 Based on NIST’s measurements, the new materials—a family of multilayered crystalline sandwiches—might enable a whole new class of compact, high-performance, high-efficiency components for devices such as cellular phones. May 1, 2018 - Dielectric Metamaterial is Dynamically Tuned by Light Duke TodayMetal-free metamaterial can be swiftly tuned to create changing electromagnetic effects. January 18, 2019 - Gate tuning from exciton superfluid to quantum anomalous Hall in van der Waals heterobilayer Science AdvancesVan der Waals heterostructures of two-dimensional (2D) materials provide a powerful approach toward engineering various quantum phases of matter. March 12, 2019 - Dielectric Crafts VHF Antenna for Sutro Tower Repack TV TechnologyThe antenna array will serve KGO-TV and KRON-TV in San Francisco, with installation slated for later this year. August 24, 2018 - Experimental realization of deep-subwavelength confinement in dielectric optical resonators Science AdvancesThe ability to highly localize light with strong electric field enhancement is critical for enabling higher-efficiency solar cells, light sources, and modulators. September 1, 2016 - 'Extreme' microscopes inspire new materials Futurity: Research NewsMaterials scientists are pushing the limits of electron microscopy into the tens of picometer scale, a fraction of the size of a hydrogen atom. March 2, 2017 - Electrically tunable metasurfaces pave the way toward dynamic holograms Phys.org(Phys.org)—Dynamic holograms allow three-dimensional images to change over time like a movie, but so far these holograms are still being developed. December 20, 2018 - New High-Power, Tunable THz Laser Is Slated for Space Mission Photonics.comA new terahertz (THz) laser designed by researchers at Massachusetts Institute of Technology (MIT) has demonstrated high constant power, tight beam pa.
March 16, 2019 - Scientists Develop Micro-Electromechanical Energy Harvester Veteran's WeeklyScientists developed a micro-electromechanical energy harvester that will put free energy into good use, according to a report published on January 28, 2019. December 7, 2018 - A new 'spin' on kagome lattices Phys.orgLike so many targets of scientific inquiry, the class of material referred to as the kagome magnet has proven to be a source of both frustration and amazement. February 23, 2016 - Flexible Optical Metasurfaces Promise "Smart" Contact Lenses IEEE SpectrumFor first time, flexible, mechanically tunable, dielectric resonators are developed for metasurfaces. March 18, 2019 - Test and measurement for finding defects in high-voltage multi-layer ceramic chip capacitors (MLCCs) Military & Aerospace ElectronicsELK GROVE VILLAGE, Ill. – High-voltage multi-layer ceramic chip capacitors (MLCCs) can experience field failures that are instantaneous and catastrophic. July 25, 2018 - Tunable Metalens Can Change Its Focus in Real Time, Like a Human Eye Photonics.comResearchers have demonstrated electrically tunable large-area metalenses controlled by artificial muscle technology. The adaptive metalens simultaneou. July 27, 2015 - Polarization-tuned Dynamic Color Filters Incorporating a Dielectric-loaded Aluminum Nanowire Array Nature.comNanostructured spectral filters enabling dynamic color-tuning are saliently attractive for implementing ultra-compact color displays and imaging devices. December 21, 2018 - Controlling a Nanoparticle's Position with Light Optics & Photonics NewsPatricia Daukantas. Scatterings image. Lorenzo Magrini in the physics laboratory at the University of Vienna. [Image: Lorenzo Magrini, University of Vienna]. December 16, 2017 - Developing Gold Nanoparticle-embedded Dielectric Thin Films Science TrendsResearch on noble metal nanoparticles has always remained interesting because of their optical and electronic properties. Gold nanoparticles (AuNPs), in. November 28, 2018 - New Model Metamaterial Improves Accuracy of Nanosensor Cloaking Photonics.comA new metamaterial could improve the accuracy of nanosensors in optics and biomedicine by cloaking them from external radiation. Researchers from. March 15, 2019 - Shaping the future of RF/microwave components SatelliteProME.comDr. Miguel A. G. Laso looks at some of the key technologies that are shaping the future of the RF/microwave passive components onboard satellites. March 27, 2018 - Phoenix Model Market for Next-Gen TV to Be Powered by Industry-Leading Broadcast Technologies Business WireBroadcasters in Phoenix are working together to make next-generation television a reality in one of the nation's most important over-the-air TV market.